Betonline is One of the largest sportsbooks online. Betonline Some of the largest wagering limits for Americans. BetOnline is not one of the all too common examples of a sportsbook that plans to get by on a home run website name while leaving other parts of the business lacking. BetOnline ownership has invested in experienced wagering and customer service managers who understand that the sportsbook's first priority is service over sales. This attitude is passed along to the staff during training classes that each wagering clerk and service agent is required to pass. BetOnline treats players with respect and aims to gain a player's loyalty by providing VIP level service; including a generous sign-up and reload bonus. By offering a 50% bonus on every deposit for life, BetOnline is making a statement. They are showing their bettors that their customers are appreciated – not just for the first bets, but long-term. This bonus does have a 6x rollover (which is higher than other sportsbooks). So, BetOnline has more bonuses, but a higher betting requirement to earn that bonus. On top of this you’ll get free play opportunities for using live betting for the first time, and for trying the mobile phone betting too. There are also track rebates of 7% for horse racing bettors. In addition to these regular bonuses you will find plenty of seasonal and one-off promotions. This book focuses on the US big four which consists of Football, Baseball, Basketball and Hockey. 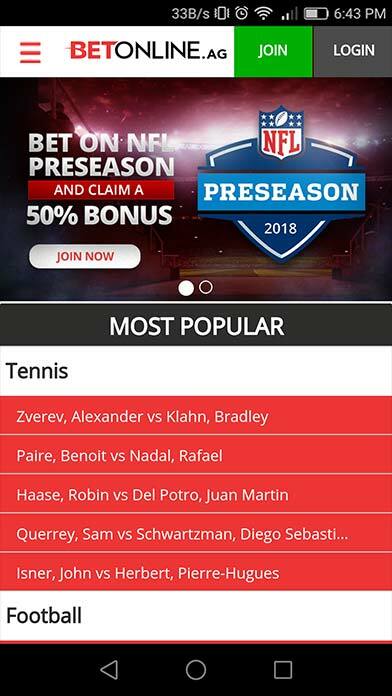 You’ll find a great selection of bets and some reduced juice lines for these sports. In addition College Football and Golf are popular here. Completing the list is a range of international sports including Soccer, Rugby and Snooker. You’ll benefit from a large database right on their website covering past results and analysis – all you need to make an informed bet. BetOnline also feature a separate horse racing section. This covers the majority of US tracks, offering bets on both day-to-day races and the big events. At BetOnline they offer one of the widest selections of live betting options in the industry. The live betting interface is well designed and easy to use and navigate. Finding your game and placing a wager while following along with the action is quick and easy. On a nightly basis, this online sportsbook provides live betting odds on almost every event you can think of, including all major sports such as MLB, NFL, NBA and NHL.